Virtually every trader and investor is aware about technical and fundamental analysis. But little understand the importance of sentiment. We consider a case study of GE vs DAI, which particularly good illustrates the importance and interaction of these three components. On 20.10.2017 both General Electric and Daimler published their quarterly reports. Of course, DAI and GE are not in peer group. But they are, so to say, semi-peers. Indeed both are old companies, both produce machinery, have comparable Sales (in Q3: €40.8 bn DAI, $35.5 bn GE) and both are in, respectively, DAX or DJ30. Let us have a look how the market reacted on the quarter reports. Daimler and General Electric intraday prices on 20.10.2017. The market has reacted on a pretty similar fundamental information in quite an opposite way! Let us, however, look at 3-Year charts. As you can readily see, the General Electric is in a strong downtrend, which is likely the reason why the market sentiment about this stock is negatively biased. Thus the market (at first) reacted by upto -6% drop. 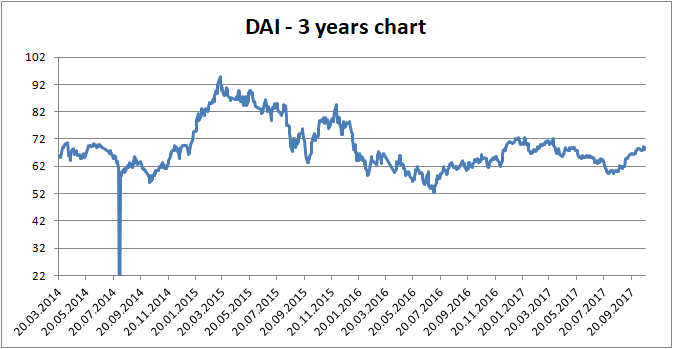 As to Daimler, it does not flourish as well (DieselGate impacts still) but from TA point of view one can assume a reversal to an uptrend. Interesting, however, the reversals in afternoon. By Daimler it can be explained just by normal daily volatility but by General Electric it is a little bit too big. 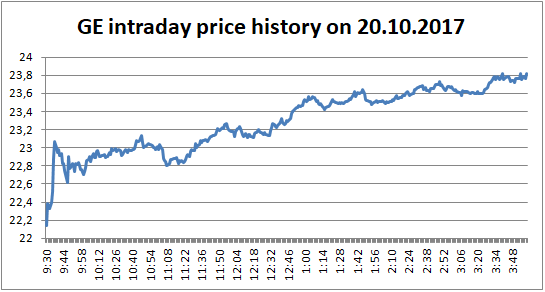 I would suggest to keep an eye on GE stock, this strong intraday reversal may indicated the reversal of global trend. A long-term investor may already now commit the first small(!) buy tranche. A fastidious reader may argue that a single case that we considered is not yet a proof of concept. This is of course true. However, everyone, who watches the market, will recall enough of such cases. For instance, Lufthansa is currently the most performing stock in DAX and virtually every news or data on LHA is interpreted positively by the market. 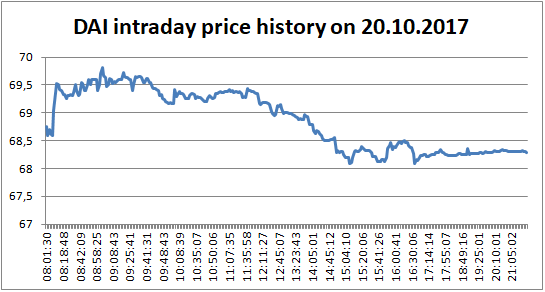 However, two years ago - as the market sentiment about LHA was bad - the situation was quite contrary: e.g. there was a massive sell-off on 29.10.2015, as Lufthansa raised the forecast. Though in the long term the price does, likely, converge to the stock fundamentals, one should never forget about the sentiment in the short and mid-term! You may also be interested in this and this posts. 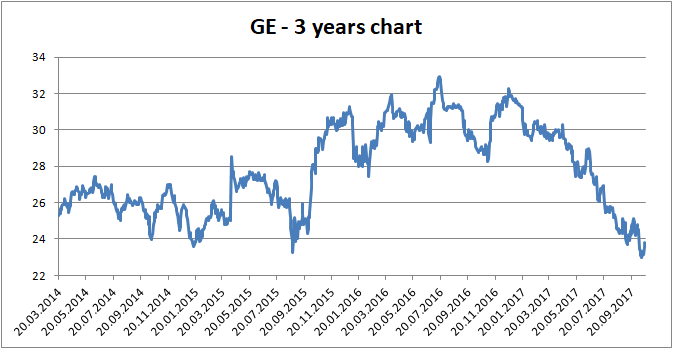 By GE the EPS turned out to be much lower than the analysts expected, whereas by Daimler it was close to expectation (€2.16) according to yahoo.finance. But this is also an argument for the sentiment importance! Moreover, "But [GE] shares staged a dramatic reversal, as investors warmed up to Flannery's vow that "everything is on the table" and that no "sacred cows"".